Detangler and Shine will neutralize static hair electricity instantly. Knots and dreadlocks fall out tangle free right away, no matter how difficult. The silk protein in COWBOY MAGIC® Detangler and Shine results in a high shine after brushing. Size: 4 oz. and 16 oz. It neutralizes static electricity: Instantly detangles hair that is difficult to brush and comb. Minimizes hair loss due to pulling and breakage. It only takes a small amount: A small amount (about the size of a nickel) massaged into wet or dry hair will instantly detangle and deep condition. Continue to add nickel sized amounts and brush through until a rich, silky-smooth, shine appears. 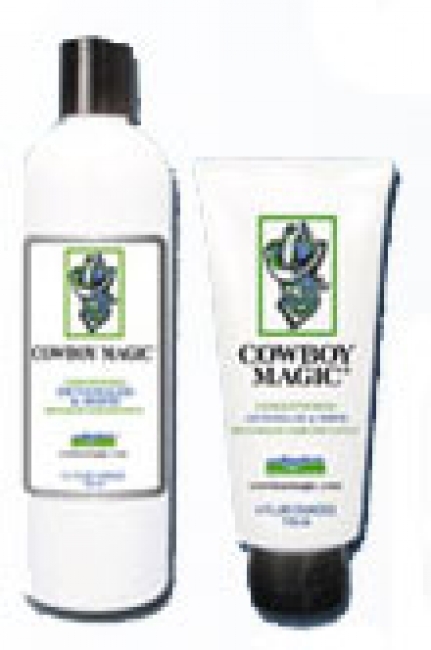 It works on people, too: COWBOY MAGIC® Detangler & Shine works on human hair.